A motorhome, or motor caravan as it is officially known, gives you the freedom to go where you want, when you want. It can transform your leisure time, turning every weekend into a holiday and every holiday into an adventure. There's a great choice of sizes and layouts, ranging from compact campervans to luxurious A-class vehicles, plus an abundance of places to stay. Fresh air. Fun. Freedom. 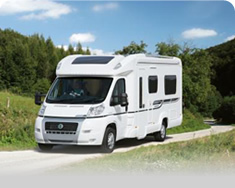 Find out all about motorhomes at the NCC Shows (each year in February and October) at the NEC Birmingham. Header images courtesy of Swift, Elddis and Phil Russell, Practical Motorhome.